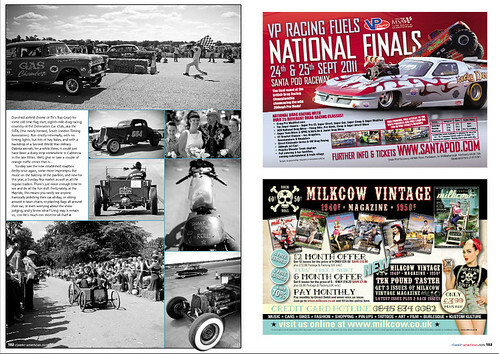 Here’s some of the tearsheets of the Hayride coverage, still more to come yet. 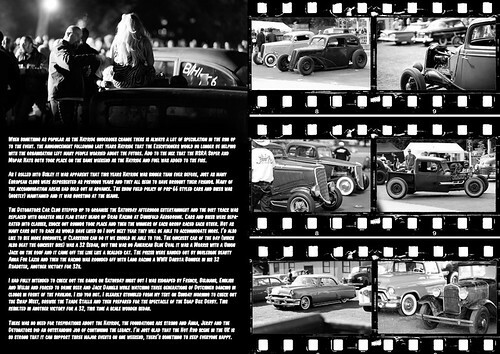 First up my article in Street Gasser Magazine, I wrote the article for this one too. “When something as popular as the Hayride undergoes change there is always a lot of speculation in the run up to the event. the announcement following last years Hayride that the Executioners would no longer be helping with the organisation left many people worried about the future. Add to the mix that the NSRA Super and Mopar Nats both took place on the same weekend as the Hayride and fuel was added to the fire. As I rolled into Bisley it was apparent that this years Hayride was bigger than ever before, just as many European clubs were represented as previous years and they all seem to have brought their friends. Many of the accommodation areas had sold out in advance. The show field policy of pre-66 styled cars and bikes was (mostly) maintained and it was bursting at the seams. 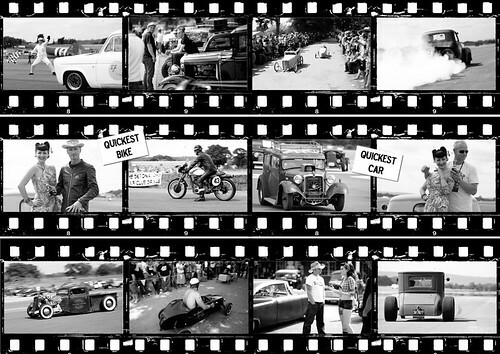 The Detonators Car Club stepped up to organise the Saturday afternoon entertainment and the dirt track was replaced with quarter mile flag start heads up Drag Racing at Dunsfold Aerodrome. Cars and bikes were separated into classes, knock out rounds took place and then the winners of each group raced each other. Not as many cars got to race as would have liked so I hope next year they will be able to accommodate more. I’d also like to see more burnouts, if Clarkeson can do it we should be able to too. The quickest car of the day (which also beat the quickest bike) was a 32 Sedan, but this was no American Blue Oval it was a Morris with a Union Jack on the roof and it came off the line like a scalded cat. The prizes were handed out by burlesque beauty Anna Fur Laxis and then the racing was rounded off with Lang racing a WWII Dakota Bomber in his 32 Roadster, another victory for 32s. I had fully intended to check out the bands on Saturday night but I was kidnaped by French, Belgians, English and Welsh and forced to drink beer and Jack Daniels while watching three generations of Dutchmen dancing in cloggs in front of the pavilion. I kid you not. I blearily stumbled from my tent on Sunday morning to check out the Swap Meet, browse the Trade Stalls and then prepared for the spectacle of the Soap Box Derby. This resulted in another victory for a 32, this time a scale wooden sedan. 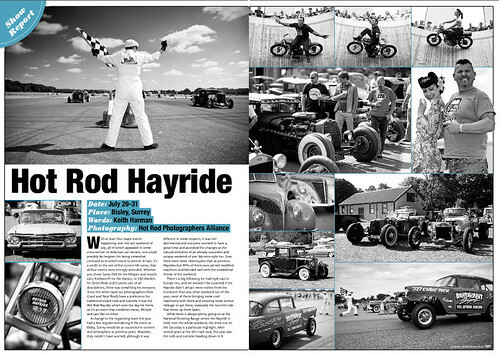 Next up the article in Classic American, this was a Hot Rod Photographers Alliance collaboration with Neal Reed. Keith Harman wrote the article. 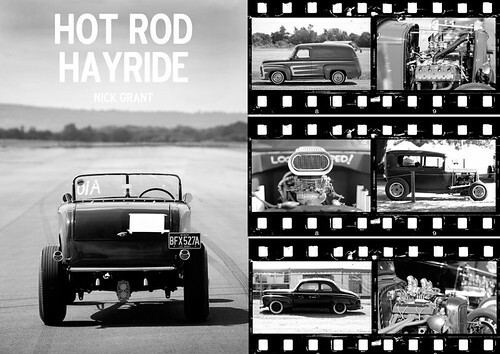 There were also a couple of shots in Custom Car, still to be published is the Old Skool Rodz article, I gave different shots to all of the magazines.